Who will the Democrats run for President in 2020? Check out their answers to your Round 8 questions! This round of questions were selected by wayne-klops. 1. wayne-klops: Most of the male figures released by Mattycollector had removable armor. When produced correctly so the figures didn't look bloated, it was great to have removable armor. Will you continue to keep armor glued in place, or will you start designing the armor to be removable as long as it doesn't ruin the look of the figures? Wherever possible we will make armor removable. In some cases it may not work, and we may then glue in place or make a full sculpted torso, like we did with Club Grayskull Hordak. 2. man-at-work: Stridor is receiving a positive response from customers with the $60.00 price. If Stridor's sales were a success, will you start to offer more oversized items on a regular basis, using more existing tooling from Mattel's factory? We are certainly open to this! If the tooling is available, which tends to be a case-by-case issue, and enough people are interested, we will explore what other larger items are possible. 3. 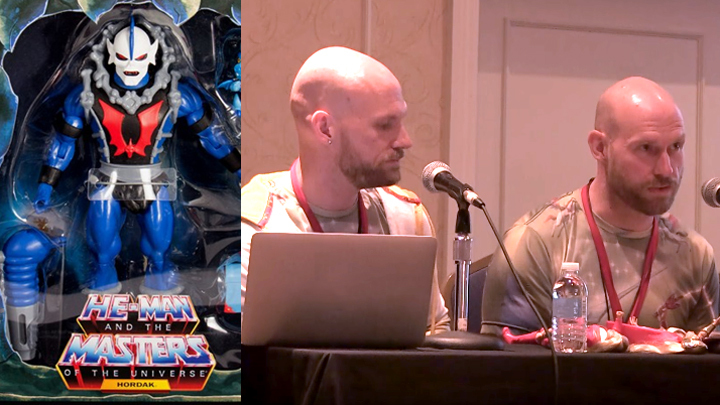 Niki: In 2016, Mattel's Sanders brothers told POP fans about never-before-known characters Spidra, Volcania and La-Ver. Does Super7 have the rights to release them in Collectors Choice? We would have to investigate that one. It seems to us that we should be able to go there, but there could be unforeseen issues that arise in using characters that were realized and released as part of the 80s POP intellectual property versus characters that were conceptualized but never existed beyond that. We'll have to discuss with our friends at Mattel! 4. King Tamusk: Previously, Mattycollector offered an annual subscription incentive to subscribers of the Classics line in the form of a sub exclusive figure. Have you considered doing something similar as an incentive item to preorder both semi-annual waves of CC & CG? It might be a good opportunity to get a highly demanded variant or pack-in out there, and increase sales further for both waves as a whole. We looked at the Mattycollector model as well as several other possibilities for the release plan of the Classics line. Ultimately, the current model was the most feasible for a company our size, and we will likely maintain this model for the foreseeable future. That said, we know that having some fun surprises and extras are part of what make this hobby fun, and we will continue to find ways to add these types of items to the line. 5. nickdoobs: The quality of the Ultimate figures Super7 released was outstanding, thanks to use of Mattel's factory. But it seems like the Club Grayskull and Collector's Choice figures you've released at your own factory have had quite a bit of QC issues. Is it possible for Super7 to go back to using Mattel's factory? A number of fans are concerned the QC issues will not improve and are hesitant to keep pre-ordering as a result. We are committed to getting any QC issues resolved and we are hopeful that the next wave of figures will have everyone satisfied. The specifics of manufacturing at any factory gets a bit murky for discussion, but we want everyone to have high-quality products! Check out what fans have to say about the answers to the WTFWTK 3.8, as well as find links to all the previous Fan Q&A sessions!